Whether you're vegan, lactose intolerant or simply want a change, almond milk is such a yummy alternative to dairy milk. That said, the stuff you buy in the box usually has some sort of "gum" in it, creating a thicker drink than the homemade version. For me, it tastes fake, especially since I've been making the real thing for years and much prefer the flavor of fresh almond milk. It's so simple, takes only a few ingredients and is worth the smile. It's almond milk, so of course, the main ingredient is the almond. Use raw, organic almonds. (The only way to obtain real raw almonds in the US is to buy directly from the farm. Here's a bit of info on that subject. Obviously, you are most likely not going to your local, organic, almond farmer, so do make sure the store bought are organic to avoid buying the ones that have been exposed to PPO.) Soak overnight for best results and optimal nutrition and flavor. They enlarge a bit after soaking, so usually a little more than 3/4c will yield the 1c needed for the recipe. Make sure to rinse them well before using. The skins do not need to be removed. The sweet component is not necessary, but if you want that sugary kick and don't have dates, raw honey or agave will always work. Maple syrup will add an entirely different dimension, if you like the flavor. Don't forget to pit your dates or your blender will remind you that you didn't. Just squish them between your fingers and the pit will pop out. Place all of your ingredients in your blender and set to high. 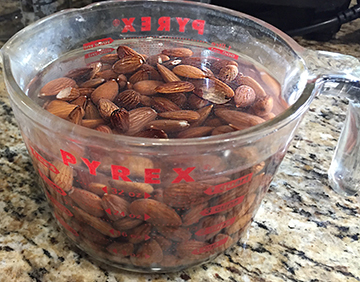 I blend for at least 2 minutes, if not longer, to squeeze every ounce of flavor out of the almonds. Place your cheesecloth over a strainer and pour your milk through. Gather the ends of the cheesecloth, twisting and squeezing to get out all of the liquid (this may take a few minutes) and Voila! The best almond milk you've ever had. Enjoy!